Salivary gland lesions (SGL) represent 3%–6% of all tumors of the head and neck region. Proper management of these tumors requires an accurate diagnosis by the pathologist, radiologist, and clinicians. FNAC is a useful, simple, cost-effective, and minimal invasive procedure. There was varied nomenclature and reporting formats for SGL from two category schemes to five or more category schemes, which made it difficult for clinicians to interpret the reports.,, To make uniform reporting pattern, American Society of Cytopathology (ASC) and the International Academy of Cytology (IAC), gathered in September 2015 at the European Congress of Cytology, held in Milan, Italy, to propose Milan System, with the aim to produce a practical classification system that is user-friendly and internationally accepted. There were 40 participants from 14 countries. This system is based upon evidence from the literature as well as upon the experience of a multidisciplinary group of experts involved in the field of salivary gland cytopathology. Later on, a monograph “Milan System for Reporting Salivary Gland Cytopathology (MSRSGS),” which includes diagnostic criteria, explanatory notes, implied risk of malignancy (ROM), and a brief management plan for each diagnostic category was promulgated. This is a six-category scheme: A “neoplasm” category that is split into “benign” and “salivary gland neoplasm of uncertain malignant potential (SUMP).” Each category has an implied cancer risk, ranging from 0% to 67% for the “nondiagnostic” category to high 57%–100% for the “malignant” category. This study was carried out to classify salivary gland lesions under Milan counsel, to ascertain rate of malignancy and also to determine the diagnostic accuracy in and around our institute by correlating the cytohistopathological diagnoses on the resected specimens and biopsies. A retrospective study was conducted on the all cases of salivary gland swelling (SGS) and went to the pathology department “between” May 2016 and April 2018. This study received approval from the Institutional Ethics Committee. Patients of all ages, either gender, and willing for participation were included and patients those suffering from psychiatric illness, surgical illness, and those were unwilling for FNAC excluded from this study. In duration of 2 years, total 105 cases of SGS in the parotid, submandibular, and other region were identified. After recording the relevant clinical details, FNA was performed under aseptic precaution using a 10 ml disposable syringe and 23/24 gauge needle without local anesthesia with informed consent. If the aspirate was insufficient, a repeat aspiration was done. The material was aspirated and the character was noted. Routine smears prepared, Giemsa staining was done on the air-dried smears while those fixed in 95% alcohol were stained by Papanicolaou's method. The results obtained on FNAC were divided into six categories as per Milan system: (1) nondiagnostic, (2) nonneoplastic, (3) atypia of undetermined significance (AUS), (4) neoplastic (benign and uncertain malignant potential [UMP]), (5) suspicious for malignancy (SFM), and (6) malignancy. For histopathology examination, 10% neutral buffer formalin fixed, surgically resected specimen and biopsy tissues were received, processed, and stained with H and E (hematoxylin and eosin). The rate of malignancy, sensitivity, specificity, positive predictive value (PPV), negative predictive value (NPV), and diagnostic accuracy were evaluated on the basis of final histopathological correlation. Results of cytology and histopathology were compared and ROM was calculated by dividing the total number of cases turned out to be malignant on histopathology in each category by number of cases in each category on cytology. For statistical calculations cytological diagnoses were classified as positive (malignancy) and negative (benign). Patients with negative cytological diagnosis but later diagnosed as cases of carcinoma histopathological examination were considered as false negative, whereas patients with positive cytological diagnosis but later diagnosed benign were taken as false positive. Histopathological report was considered as the gold standard. Of 105 patients, 73 (69.52%) were male and 32 (30.48%) of them were female. Highest incidence in male patient was found in 31- to 40-year age group comprising 19/73 (26.02%) cases of total and female was between 51 and 60 years comprising 08/32 (32.00%) cases of total. Overall highest incidence was found between 31 and 40 (23.80%) years age group as shown in [Table 1]. Male:female ratio was 2.2:1. Parotid gland was the most common site to be involved (N = 63; 59.05%) followed by submandibular gland (N = 33; 31.43%) and minor salivary gland (N = 10; 09.52%) [Table 2]. None of the cases of sublingual salivary gland lesions was observed in this study. The FNAC results were categorized into six groups of Milan system reporting of salivary glands and results as nondiagnostic in 03/105 (2.08%) cases, nonneoplastic in 17/105 (16.20%) cases, AUS in 03/105 (02.85%) cases, and neoplastic in 60/105 (57.14%) cases [benign: N =54/60; 51.43% and UMP: N =06/60; 04.76%]. SFM was noted in 05/105 (04.76%) cases and malignant in 17/105 (16.20%) cases. 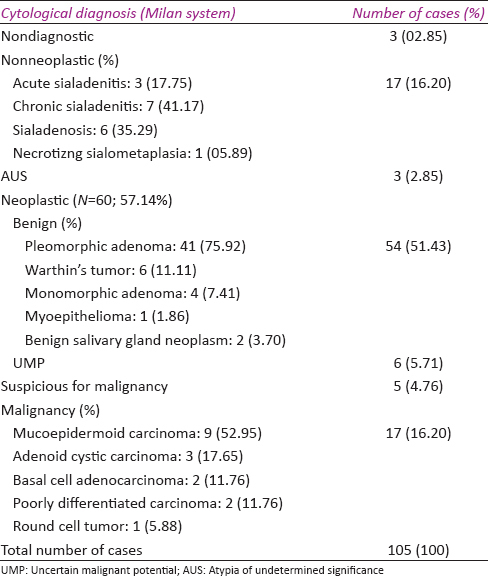 In nonneoplastic, benign and malignancy categories, the most common lesion was chronic sialadenitis (N = 7), pleomorphic adenoma (N = 41), and mucoepidermoid carcinoma (MEC) (N = 9), respectively [Table 3]. We received 76 tissues (biopsy and specimen) for histopathological examination. In cytohistopathological correlation, concordance was found in 62/76 (81.58%) cases, whereas 8 (10.52%) cases were discordant as benign and 6 (07.90%) cases discordant as malignant [Table 4]. In 02/76 cases, with non-diagnostic smears, one case turned out to be sialadenosis and one case came out as chronic sialadenitis (malignancy risk = 0.0%). Among 10/76 cases of nonneoplastic category, 2 cases were turned to pleomorphic adenoma (malignancy risk = 0.0%); among 2/76 cases of AUS, 1 case was turned out to be pleomorphic adenoma and one case as low-grade MEC (malignancy risk = 50.00%) [Figure 1]a and [Figure 1]b; among 41/76 benign cases, 1 case was came out to be acinic cell carcinoma (malignancy risk = 02.44%) [Figure 1]c and [Figure 1]d. Out of 3/76 cases of SUMP, 2 cases were diagnosed as pleomorphic adenoma and 1 case was diagnosed as basal cell adenocarcinoma (malignancy risk = 33.33%) [Figure 2]a and [Figure 2]b. In SFM category, true malignancy was present in all 3/76 cases (malignancy risk 100%) [Figure 2]c and [Figure 2]d. In the last malignant category, true malignancy was present in 14/76 cases (malignancy risk = 93.33%). In this study, the sensitivity, specificity, PPV, NPV, and diagnostic accuracy of FNAC in diagnosing salivary gland lesions using Milan system was found to be 85.00%, 98.14%, 94.44%, 94.64%, and 94.59%, respectively. The FNAC was introduced in 1920s, and due to its easy performance and rapidity in diagnosis, it gathered wide acceptance among clinicians. Its important role is to know the origin of lesion, type of pathology, and nature of disease, either benign or malignant, that helps in definite management plan, and it was developed in Europe in 1950 by Antoine Zajdela. In much previous literature, lesions of salivary gland were divided into many formats. A five-group approach system was contrived by Miller's including: (1) myxoid-hyalin, (2) basaloid, (3) oncocytoid, (4) lymphoid, and (5) squamoid lesions. Tessy et al. classified as inflammatory, benign, malignant tumors, and others., Some author's did study under the three groups including nonneoplastic lesions, benign, and malignant tumors. During the reporting of salivary glands lesions, there are lots of confusions like: difficulty in category-wise distribution, particular type of lesion, issue regarding descriptive reports (no categories), and surgical pathology nomenclature. So, Milan system for reporting salivary gland cytopathology (MSRSGC) was organized by the ASC and the IAC in 2017, including six broad categories. The target was to nurture better conveying between clinicians and institutions in order to make better patient care. In this study, the percentage of nondiagnostic is 2.08%, Nonneoplastic is 16.20%, and neoplastic is 57.14%, that is, quite similar to the study of Rohilla et al. in which the percentage were 2.2%, 55.8%, and 40.4%, respectively. In addition, for a salivary gland mass, prior to FNA ROM depends upon the size and location of the lesions: 20%–25% in the parotid gland, 40%–50% in the submandibular gland, and 50%–81% in the sublingual and minor salivary glands. On follow-up histopathology, recent study presents the overall ROM for different categories that demonstrated almost similarities to the actual ROM of the MSRSGC. But, in some literatures, there were some significant deviations present in AUS and SUMP.,,,, [Table 5] Among the various nonmalignant categories was highest in category III (AUS) followed by categories IVb (SUMP) and IVa (Benign) comparative with the study of Rohilla et al. The category AUS is reserved for specimens that contained limited atypia and a neoplastic process cannot be excluded. The cases diagnosed as AUS is anticipated <10% of all salivary gland FNAs. Higher rates likely represent overuse of this category when other interpretations are more appropriate. The recommended management is a repeat FNA and surgery. In our study, 02.85% (ROM = 50%) of the cases belong to this category and various studies in the literature showed the wide range (0%-73.08%) of ROM for the AUS category. This variation depends upon the subjective error and number of cases and we agree that the fewer number of histopathologically proven cases could have affected the ROM in the current study. So, there is indigence to polished exact defining criteria for this category. Esther et al., 2018 give rise an update on the Milan Classification System for Salivary Gland Tumors with the aim to provide a practical, uniform reporting system linked with risks of malignancy, emphasis on the differential diagnosis, diagnostic problems, and pitfalls according to the new Milan system for reporting salivary gland cytopathology. Sensitivity and specificity establish various ranges which depend upon the experience of operator performing the FNAC, quality of the cytology preparations, experience of the evaluating cytopathologist, morphological heterogeneity of the lesion, and presence of a cystic component. Overall sensitivity, specificity, and diagnostic accuracy of salivary gland FNA in most series ranges from 86% to 100%, 90% to 100%, and 48% to 94%, respectively. To the best of our knowledge, there is only one literature searched, describing the sensitivity, specificity, and diagnostic accuracy, but no literature was found to describe the PPV and NPV of salivary gland lesions based on Milan nomenclature. In our study, the overall sensitivity, specificity, and diagnostic accuracy were 85.00%, 98.14%, and 94.59%, respectively, indicating good results as compared with the study done by Rohilla et al. [Table 6]. This study was undertaken to classify the salivary gland lesions based on MSRSGC and also the aim of this classification system may be much better for reporting salivary gland as each diagnostic category conveys specific risks of malignancy, which provide data that would help in planning the therapeutic approach in patients. MSRSGC facilitates more consistent and uniform reporting of salivary gland FNAs. The overall rate of histological proven malignancy and/or diagnostic accuracy, implementing MSRSGC, may result in lower nondiagnostic rate, less descriptive or implicit interpretation, decreased rate of surgical followup for benign and AUS category, and a reduction of histology-confirmed malignancy in benign category. Artur CV, Felipe N, Luise M, Gabriela S, Lélia BS, Pablo AV, et al. Clinicopathological analysis of salivary gland tumors over a 15-year period. Bio Reprod 2016;30:1-2. Rajendra Santosh AB, Bakki SR, Manthapuri S. A review of research on cytological approach in salivary gland masses. Indian J Dent Res 2018;29:93-106. Thangam R, Vaishali DK, Dhananjay SK, Koteeswaran G, Kannan NS. Cytological and histomorphological correlation of salivary gland lesions: An experience at rural tertiary healthcare hospital. APALM 2017;4:219-3. Subrata P, Sajeeb M, Kingshuk B, Shubham B, Rajashree P, Barnali M. Fine needle aspiration cytology of parotid lesions: A study of 84 cases with special reference to cyto-histological discrepancy. Int J Med Res Prof 2017;3:285-90. Esther DR, Zubair B, Marc P, William CF. The Milan system for reporting salivary gland cytopathology (MSRSGC): An ASC-IAC-sponsored system for reporting salivary gland fine-needle aspiration. J Am Soc Cytopathol 2018;7:111-8. Zubair B, Andrew SF, Nora K, Bruce MW. The Milan System for Reporting Salivary Gland Cytopathology. In: William CF, Esther DR, editors. The Milan System for Reporting Salivary Gland Cytopathology. 1st ed. American Society of Cytopathology. Springer International Publishing AG; 2018. p. 2-4. Naz S, Hashmi AA, Khurshid A, Faridi N, Edhi MM, Kamal A, et al. Diagnostic role of fine needle aspiration cytology (FNAC) in the evaluation of salivary gland swelling: An institutional experience. BMC Res Notes 2015;8:101. Bhardwaj A, Pandey A, Kishore S, Kaushik S, Maithani T. Cytohistological Study of Head and Neck lesions and their Diagnostic Pitfalls. APLM 2016;3:397-7. Panchal U, Shah GH. A cytological and histological comparative study of salivary gland lesions at tertiary health care centre. Int J Biomed Adv Res 2015;6:470-4. Sonal V. Fine needle aspiration cytology of salivary gland lesions: Study in a tertiary care hospital of North Bihar. Int J Res Med Sci 2016;4:3869-72. Jain R, Gupta R, Kudesia M, Singh S. Fine needle aspiration cytology in diagnosis of salivary gland lesions: A study with histologic comparison. Cytojournal 2013;10:5. Uma T, Malay B, Ankit J, Dhupia JS. FNAC of salivary gland lesion-study of 126 cases at a tertiary care center of national capital region India. J Med Dent Sci Res 2014;1:4-6. Tessy PJ, Jayalekshmy PS, Cicy PJ, Usha P. Fine needle aspiration cytology of salivary gland lesions with histopathological correlation – A two year study. Int J Healthc Biomed Res 2015;3:91-9. Tushar K, Banyameen I, Amardeep P, Harsh K. Diagnostic role of FNAC in salivary gland lesions and its histopathological correlation. Indian J Pathol Oncol 2016;3:372-5. Rohilla M, Singh P, Rajwanshi A, Gupta N, Srinivasan R, Dey P, et al. Three-year cytohistological correlation of salivary gland FNA cytology at a tertiary center with the application of the Milan system for risk stratification. Cancer Cytopathol 2017;125:767-75. Sheetal GG, Mani K, Gautam NG. Study of cytological and histopathological correlation in salivary gland lesions. NJMDR 2016;5:25-2. Yogambal M, Chandramouleeswari K, Marylilly SA. Role of fine needle aspiration cytology in salivary gland pathology and its histopathological correlation: A five year descriptive study in a tertiary car centre. Otolaryngol Online J 2015;5:1-7. Rajat G, Deepika D, Dinesh K, Jyotsna S. Fine needle aspiration cytology (FNAC) of salivary gland lesions with histopathological correlation in a district hospital of Jammu region. Indian J Pathol Oncol 2016;3:32-7. Wei S, Layfield LJ, LiVolsi VA, Montone KT, Baloch ZW. 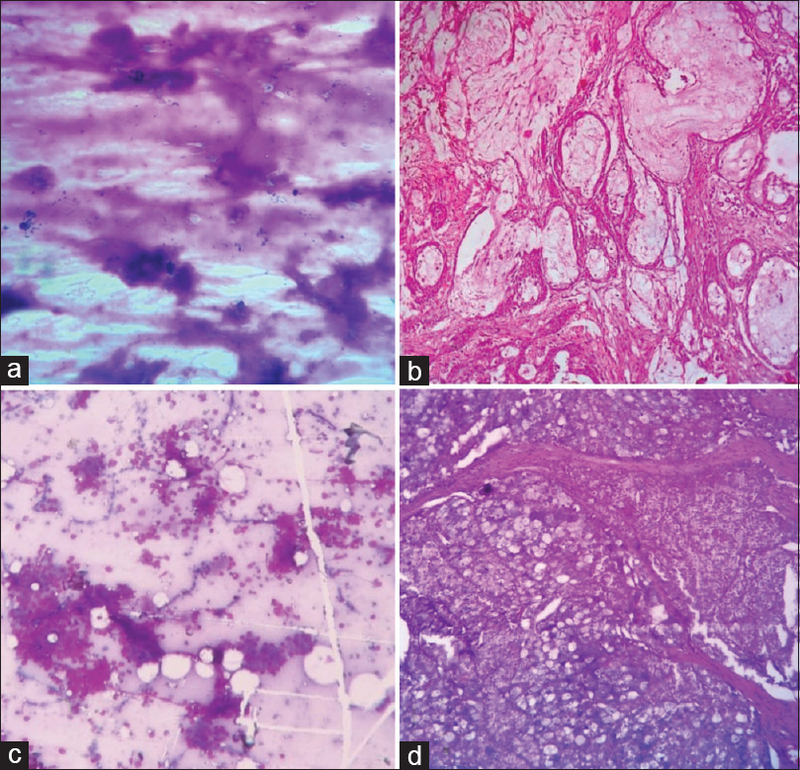 Reporting of fine needle aspiration (FNA) specimens of salivary gland lesions: A comprehensive review. Diagn Cytopathol 2017;45:820-7. Hollyfield JM, O'Connor SM, Maygarden SJ, Greene KG, Scanga LR, Tang S, et al. Northern Italy in the American South: Assessing interobserver reliability within the Milan system for reporting salivary gland cytopathology. Cancer Cytopathol 2018;126:390-6. 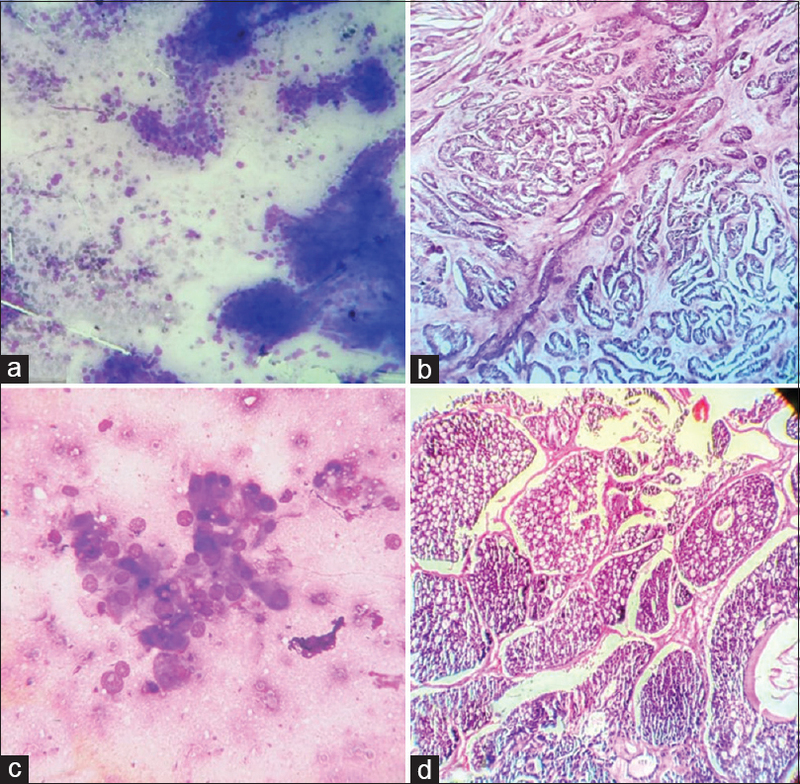 Liu H, Ljungren C, Lin F, Zarka MA, Chen L. Analysis of histologic follow-up and risk of malignancy for salivary gland neoplasm of uncertain malignant potential proposed by the Milan system for reporting salivary gland cytopathology. Cancer Cytopathol 2018. Maleki Z, Miller JA, Arab SE, Fadda G, Bo P, Wise O, et al. “Suspicious” salivary gland FNA: Risk of malignancy and interinstitutional variability. Cancer Cytopathol 2018;126:94-100. Marc P, Zubair B, William CF, Esther DR, Tabatabai ZL. Atypia of undetermined significance. In: William CF, Esther DR, editors. The Milan System for Reporting Salivary Gland Cytopathology. 1st ed. American Society of Cytopathology. Springer International Publishing AG; 2018. p. 43-2. Esther DR. Update on the Milan Classification System for Salivary Gland Tumors. ASCP on Demand Webcast; 2018.